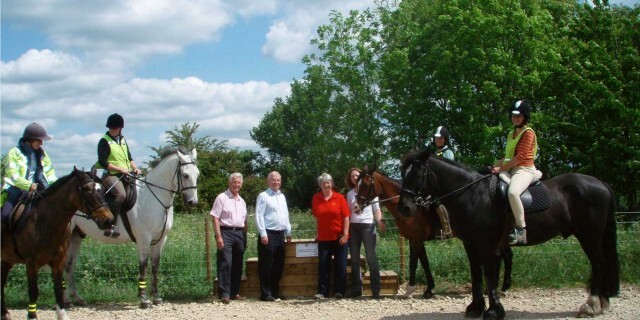 The following photo gallery shows the mounting blocks donated to the community by our group. These also provide seats with a great view of the improved river crossing! Money for the blocks came partly from that awarded by the Shelford Feast over the past three years where the group has had a stall and helped raise money for village charities etc. The ford and bridge have been put in place by the Babraham Institute, the former specifically designed for horses and incorporating a route for their use. The route that the ford and bridge are on is known locally as Rowley Lane and is widely used by walkers, cyclists and horse riders. The Group have applied for a Modification Order to upgrade the existing footpath to a bridleway and ensure that all can continue to use it in the way they are accustomed to; this has been supported by the District Council. The ford has already proved useful for our local riders! Jane Greatorex, chair of the Shelford and District Bridleways Group, used it to practice water crossings. Just recently, she was successful in achieving a Bronze award in the Exmoor Golden Horseshoe one day 50 mile class Endurance Event – as a result of which she was asked to join the British Development Squad. All of us learn all of the lively mode you deliver both interesting and useful things by means of the web blog and attract contribution from website visitors about this situation and our own child is certainly discovering so much.